My fascination with Italian spirits (the alcoholic kind) started at age 15 when I read A Farewell to Arms, where Henry and his cohorts spend an inordinate amount of time drinking grappa to gloss over the horrors of the war they are living. Hemingway also put back his share of the clear liquid while serving in Italy. I had never heard of grappa much less tasted it, but by the end of the book I was determined to find a bottle and see what all the fuss was about. Much ado about nothing, I decided. That was until a decade or so later grappa made its way back into my conscience thanks to its appearance at card games I attended as a student in Bologna. That was also about when I started hitting the mountain trails in the Italian Alps where you find grappa flowing a plenty in every restaurant and mountain hut from Mount Blac in the west to Caporetto in the east. And so grew my appreciation for grappa and digestives, infused liqueurs that Italians are fond of drinking and when possible making themselves. Take just about any fruit, herb, flower, bush, nut, spice or whatever and throw some pure alcohol on top. Wait a few weeks then add some water and sugar and you have your digestive. Travel as much as I do and soon you have tried quite a few homemade digestives from one infused with high-altitude flowers in the north to one made with prickly pears in the south. Not long ago I tried a new one on a recent trip to Muro Leccese, in the deepest of Italy’s deep southeast, where I happened to find myself having lunch at Masseria Lacco, which is immersed in olive groves and, as it happens, laurel bushes. Lunch was good, actually excellent, but the takeaway unforgettable culinary highlight actually came in a small shot glass: laurel digestive. I went home with the recipe as well as many bunches of laurel leaves and berries. It’s rare that a recipe comes out great the first time you try it and this was no exception, first too strong then too sweet. Anyway, here’s the recipe. I suggest you start with maybe 150 grams of sugar and then slowly add more as needed. Let the laurel leaves and berries infuse in the alcohol for two-three weeks. Strain away what remains of the berries and leaves then add the water and sugar stirring until it dissolves in the alcohol. Better to wait a month before drinking to let the flavors settle. That’s pretty much it. Let me know if you’ve made or drank any interesting digestives you think I should know about. 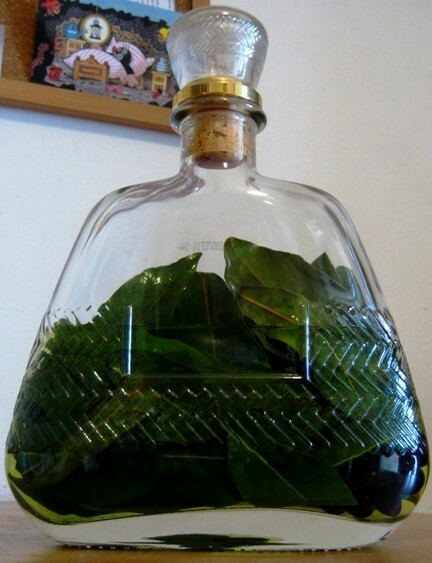 Laurel digestive during the infusion with the leaves and berries. Great article, Eric. A whole new perspective on Italian Slow Food. mi piacerebbe sentire da loro che sono ancora vivi dopo aver provato il loro proprio liquore. Per esempio, gli ingredenti per una grappa casalinga? Non dimenticare, che sono io un raga di citta, e non trovo facilmente un torchio da uva. Se sia interessato, so una barzelletta del “Kentucky Moonshine”—fammi sapere–cin-cin a tutti! Certo che siamo interessati a sentire la barzelletta. Oramai la devi raccontare.